Can you look this monster in the eye? The term hurricane is derived from Huracan, the name of a Mayan storm god. Over its lifetime, one of these massive storms can release as much energy as a million Hiroshima nuclear bombs (NS). A tropical storm becomes a category 1 hurricane (or cyclone or typhoon) when winds reach sustained speeds of 120 kilometers per hour (kph). 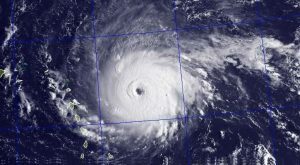 A hurricane becomes category 2 when sustained winds hit 154 kph, category 3 at 179 kph, category 4 at 210 kph, and finally the most devastating variety, category 5, when wind speeds hit 250 kph (NS). As you can tell, the reference to a storm god is no understatement. Hurricanes have always been violent storms; now they’re causing more damage and killing more people than ever before. Will we sit back and watch as the numbers climb, or will we do something about it? Storm activity has been increasing with the changing climate, especially in the northern hemisphere (Emanuel, K., Sundararajan, R., Williams, J. 2008). Climate change is the reason for the increase of storm surge, wind speeds, and the duration.The increase in the duration of hurricanes, storm surge which is essentially sea level rise, and the increase in wind speeds are the three components that are causing the increase in intensity. Emanuel et al. (2008) use simulation technology to show how climate change will affect storm activity into the future as well, showing that it will continue to increase as long as temperatures continue increasing. As a result of the increase in intensity, coastal communities are at much higher risks than ever of being devastated by hurricanes. An overwhelming majority of environmental scientists conclude that the main driving force for climate change is the human caused emissions of greenhouse gases such as carbon dioxide and methane. The emission of these gases cause temperatures to increase and as a result of temperature increase these components get even stronger. Somewhere between 90% and 100% of climate scientists agree that humans are responsible for climate change, with most studies finding 97% consensus among publishing climate scientists (Cook et al., 2016). The number of lives lost to these storms and the money lost because of restoration efforts will only get higher if we don’t do anything to mitigate the intensity of hurricanes. The ten costliest storms combine to an loss of 320 billion dollars in damage and a loss of 16,596 lives (CNN). Ultimately if we wish to mitigate the power of these storms we need to decrease our greenhouse gas emissions. The reason for more intense hurricanes is the increase in sea surface temperatures (SSTs). (“Sea Temperature Rise” 2010) Data collected by the National Oceanic and Atmospheric Administration and presented by the Environmental Protection Agency show an increase in SSTs and atmospheric temperatures since the year 1880. Their charts show a 1.25 degrees fahrenheit increase in global average SSTs since 1880. (“Climate Change Indicators” 2015) Higher SSTs mean that water is more readily evaporated, increasing the moisture content in the atmosphere and causing stronger storms. (“Sea Temperature Rise” 2010) SSTs are predicted to increase with the warming climate. Rising SSTs are responsible for multiple factors of storm intensity. According to Weather and Climate Change in a Changing Climate, every 1 degree celsius increase in SST leads to a 6-18% increase in rainfall and a 1-8% increase surface wind speeds in hurricanes. (Karl, 2008) SSTs are increasing with climate change, and something must be done to slow the changing climate to save our coastal communities. Hurricane intensity is primarily represented by its maximum sustained wind speed (Joshua Wurman and Karen Kosiba 2018). The force responsible for causing the movement of air is the pressure gradient force. Differences in air pressure and the pressure gradient force are caused by the unequal heating of the earth’s surface (Briney, 2018). Warm air is less dense and has a lower atmospheric pressure than cold air. These differences in atmospheric pressure are what create the pressure gradient force and wind as air constantly moves between areas of high and low pressure (Briney, 2018). So as a result of differences in temperatures, the warmer the surface of the water is, the more intense the wind becomes. Hurricane winds cause direct harm to people, infrastructure, and communities. Since wind damage can have severe and long-lasting effects on infrastructure, better understanding of the nature of these hazards, leading to better prediction and design for resiliency, is critical (Wurman and Kosiba 2018). Annual estimated storm damage in the United States is seven billion dollars. Much of that damage is caused by tree blowover that is induced by high wind gusts (Martin and Konrad, 2018). Climate change could lead to an increase in the frequency of intense hurricanes, and rapid intensification immediately before landfall may become more likely (Wurman and Kosiba 2018). A study using 23 years of satellite data taken from 1985 to 2008 showed that wind speeds over the ocean have been steadily increasing (Holm, 2011). The same study concluded that extreme wind speeds have increased over most of the globe by approximately 10% over the last 20 years, or .5% each year (Holm, 2011). Although this increase in wind speeds isn’t specific to just hurricanes, it applies to storms since wind speeds in general are getting faster. Duration of tropical storms has increased over recent years, and this is likely the result of climate change. (Webster, P., Holland, G., Curry, J., Chang, H. 2005) This study concludes that there has been an increase in frequency and duration of storms over the course of the past 30 years. In their climate model, doubling carbon dioxide levels lead to an even greater increase in higher category storms. This article also states storm activity is related to sea surface temperature (SST), which is related to climate change. (“Climate Change Indicators” 2015) As stated above, the EPA has presented data showing that there has been a 1.25 degrees fahrenheit increase in global average SSTs since 1880. (“Climate Change Indicators” 2015) With higher SSTs, moisture is more readily evaporated into the atmosphere. This moisture acts as fuel for hurricanes, causing them to rain more and last longer. (“Hurricanes form over tropical oceans,” 2013). Webster et al. show a roughly 30% increase in the global number of storm days, but little change in the global number of storms, showing that storm duration is increasing. (Webster et al., 2005) Storm days are defined as total days where a system meets the requirements of being a storm. Climate change causes increased sea surface temperatures, which more more readily evaporates moisture. The extra moisture causes longer storms with more rainfall. With storms lasting longer due to climate change, we can expect more damage and a higher risk to coastal communities (Emanuel, 2013). Duration is just one aspect of hurricane intensity. There is more to increasing intensified hurricanes. The magnitude of storm surge due to a hurricane has two components: One related to the near-coastal sea surface height (sea-level in combination with local tides) and the other related to the intensity of hurricanes (Mousavi et al. 2011). Climate change is impacting Sea-Level rise(SLR) immensely. As the climate warms, sea levels rise because of the thermal expansion of seawater and the melting of ice sheets in Greenland and Antarctica. Moreover the amount of increase will vary along the Atlantic and Gulf coast for a variety of reasons, including non-uniform changes in ocean dynamics, heat content, and salinity (Dinan, 2017). Rising sea levels, in turn, add to hurricane damage by providing a higher “launch point” for storm surges, yielding more damage from any particular storm than would otherwise be the case (Dinan, 2017). The term storm surge is essentially referring to the rise of sea levels. With higher sea levels in the ocean, coastal communities are more prone to being submerged by water. Also, hurricanes are expected to respond to global warming with many studies suggesting that the frequency of the most intense hurricanes will increase in a warming planet (Elsner et al.2008). Representative Concentration Pathways (RCPs) are four greenhouse gas concentration (not emissions) trajectories, that describe the future based on how much emissions are emitted in the years to come. Under RCP 8.5, we project a very likely mean global sea‐level rise of 0.5–1.2 m by 2100 and 1.0–3.7 m by 2200, which under the strong emissions mitigation of RCP 2.6 is lowered to 0.3–0.8 m by 2100 and 0.3–2.4 m by 2200 (Kopp et al., 2014). Thus, to properly characterize future risk relative to changes in storm surge, changes in both sea-level rise and hurricane intensity must be considered (Karthik Balaguru, David R. Judi, and L. Ruby Leung, 2016). Due to climate change; the increase in wind speed, hurricane duration, and storm surge will impact coastal areas with more intense storms in the future. With more intense hurricanes occurring there will be more damage and higher mortality rates. The steady increase in population and the associated wealth in coastal areas suggests that the risk of even larger human and economic losses will increase in the future (Cao Wang, Quanwang Li, Hao Zhang, and Bruce R. Ellingwood, 2016). Damages in the United States averaged 1.6 billion dollars annually for the period 1950–1989 and more than 6 billion dollars annually for the period 1989–1995 mainly due to hurricanes Andrew and Hugo (Pielke and Pielke 1997). The potential for even larger losses exists given that the population and property at risk are increasing dramatically; for instance, in Florida the total coastal insured property values increased from $566 billion in 1988 to $872 billion in 1993 a 55% increase (Stewart, M., Rosowsky, D., and Huang, Z. 2003). Federal spending in response to hurricanes varies from storm to storm. However, measured as a percentage of total damage—estimates of which are produced by the National Oceanic and Atmospheric Administration (NOAA)—such spending has averaged about 60 percent for the nine hurricanes that made landfall since August 2005, when Hurricane Katrina struck the Gulf Coast (Congressional Budget Office). The 2004 Atlantic season devastated the state of Florida, with four hurricanes (Charley, Frances, Ivan, Jeanne), three of which made landfall as major hurricanes. These hurricanes were directly responsible for nearly 50 deaths and over $40 billion in damage (Lorig, et al., 1996). With damages and mortality rates increasing there needs to be a carbon tax put on greenhouse emissions to reduce the amount of carbon dioxide being put into the atmosphere. This will effect the increase in hurricane intensity and reduce the intense costs being spent on damages. It is clear that climate change is causing more intense tropical storms, as shown above. Increases in wind speed, duration, and storm surge cause more significant damage to coastal communities. (Emanuel et al., 2008) Most sources state carbon dioxide concentrations in the atmosphere are to blame for climate change, as this exacerbates the greenhouse effect. This carbon dioxide is in the atmosphere because of emissions released by humans. (Hansen et al, 1981) Anthropogenic climate change is an important issue as it directly affects the safety of our coastal communities. It is important to stop or slow the progression of climate change to save lives and money in the long run. Climate change is a very difficult issue to solve as there are so many different parts behind its causes. It acts as an incentive to use less fossil fuels as people would be paying more for them. (Tol, 2018) Carbon tax has shown to be effective and supported by those in British Columbia, to the point where they supported a heavier tax. (Fragoso 2016) BC’s carbon tax is proof that showing that it can be effective in the right communities. A national carbon tax for the United States could help lower emissions and hopefully mitigate the hurricanes issue. People need a reason to reduce their fossil fuel usage, and taxing their carbon emissions could be that reason. With so many issues and possible solutions, we believe a carbon tax will be the most effective method for slowing climate change. By raising the cost of using fossil fuels, a carbon tax would tend to increase the cost of producing goods and services—especially things, such as electricity or transportation, that involve relatively large amounts of CO2 emissions. Those cost increases would provide an incentive for companies to manufacture their products in ways that resulted in fewer CO2 emissions. Higher production costs would also lead to higher prices for emission-intensive goods and services, which would encourage households to use less of them and more of other goods and services (COB). For example, (Andersen, 2004) surveyed 20 non-randomly assigned studies for the Nordic countries, concluding that carbon emissions were curbed when compared to business forecasts. Of these countries, Norway’s carbon tax had reduced the household emissions by 3–4% between 1991 and 1993; and in Denmark, a 7% decline in industrial CO2 emissions had been achieved from 1991 to 1997 while total industrial output increased by 27% (Qian Wang, Klaus Hubacek, Kuishuang Feng, Yi-Ming Wei, Qiao-Mei Liang, 2016). For households, carbon mitigation activities can improve the environment quality and mitigate the adverse impact of climate change thus can bring long-term environmental benefits to human beings. A grasp of the transmission mechanism of the effect caused by carbon taxation can help to better understand its distributional impacts and further categorize them (Wang, 2016). A carbon tax may not be the most simple system to get going, but once it’s set up correctly it’s like a well oiled machine. In Canada in British Columbia they have a carbon tax set up and it is working well for them. Studies have found that the carbon tax reduced fuel usage by at least 16% and that emissions have fallen 3.5 times faster per capita than the rest of the country. (Fragoso, 2016). (Fragoso, 2016) said “although it’s received some criticism, the carbon tax has been widely deemed a success by the government, nonprofits, and academics.” (Fragoso, 2016) also said Raising the carbon tax could be the most salient to the public as it affects everyone. It also brings direct monetary benefits, since carbon tax is revenue neutral- meaning every dollar generated goes back to the public through reductions in other taxes. Enacting a carbon tax would create a few issues that need to be acknowledged ahead of time so that the money generated from it could be allocated to necessary places. For example the installation of a carbon tax would change a wide variety of household prices (Renner, 2018). The price of electricity would inevitably increase. If methane and nitrous oxide are included in the taxation, agricultural goods and processed foods would also increase as a result (Renner, 2018). These changes in prices would disproportionately affect poorer communities. Households above the poverty lines would fall below the poverty lines, and households below the poverty lines would face more difficulty in trying to escape poverty (Renner, 2018). There is this perception that enacting a revenue neutral carbon tax will kill jobs and hurt the economy. In reality there is very little research to support this in a revenue neutral scenario. Although one study conducted found that a revenue neutral carbon tax would increase the average personal disposable income (Nuccitelli, 2014). This is due to the fact that majority of people would get a larger refund than the increase in their energy costs. Two thirds of taxpayers are projected to receive more in refunds than they pay in higher energy prices (Nuccitelli, 2014). The same study concluded that yes energy prices will increase for a decade or so but will then decline as low carbon energy sources become more cost effective. Allocation of the revenue from a carbon tax would have to be strategically thought out. In order to continue to ensure the safety of our built world in the future, current design codes and standards must be adapted to account for future climate change impacts on hurricane hazards (wind, surge, flood) (Mudd et al., 2014). In 2012, US landfalling hurricanes accounted for 143 of the 284 US fatalities caused by natural disasters, and over $52 billion in losses. (Mudd et al., 2014). The severity of this reality clearly calls for revenue allocation to be well thought out. Money also needs to be allocated towards educating people on the topic. For any substantive planning for hurricanes to take place, however, society must perceive the problem, and often there is a disconnect between perception and reality when it comes to weather and climate (Wanyun et al., 2016). Public involvement is also essential to cooperative governance in order to build sustainable and resilient communities in the face of higher hurricane risk, climate change, and sea level rise Wanyun et al., 2016). For example, public support is a necessary condition for effective implementation of land use planning policies , regional flood protection measures, and construction. Climate change is causing more intense storm activity and harming coastal communities (Dinan, 2015) Reduction of emissions is crucial to slowing climate change, and a tax on carbon emissions will help. As climate change is causing increased storm activity in the united states, the tax on carbon should be nation wide and be covered in the cost of fossil fuels (oil and natural gas) as it is difficult to track actual emissions. Hopefully with a national carbon tax enacted, the stronger storms will eventually subside and our coastal communities will no longer be under the threat of stronger storms. Emanuel, K. (2013). Congressional Budget Office: Downscaling CMIP5 Climate Models Shows Increased Tropical Cyclone Activity Over the 21st Century, Proceedings of the National Academy of Sciences, Volume 110. DOI: doi/abs/10.1175/JCLI-D-12-00539.1. Fragoso, A. (2016). Carbon emissions are priced too cheap for climate change. Karl, T., Meehl, G., Miller, C., Murray, W. (2008 June) Weather and Climate Extremes in a Changing Climate. U.S. Climate Change Science Program. Lorig, K. (1996). Outcome measures for health education and other health care interventions. Thousand Oaks, CA: Sage Publications. Martin, J. (2006). Directional Characteristics of Potentially Damaging Wind Gusts in the Southeast United States. Physical Geography, Volume 27(2), 155-169. Webster, P., Holland, G., Curry, J., Chang, H. (2005). Changes in Tropical Cyclone Number, Duration, and Intensity in a Warming Environment. Science Magazine Volume 309. Previous Article← Invasive Burmese pythons eat their way through southern Florida: the unexpected effect on our health. Very interesting and educational write up. These comments are amazing! Give us a call to see what we offer for Gutter Repair Services. I 100% believe climate changes have to do with the terrible hurricanes we keep experiencing. Maybe Carbon Tax will be the fix.